As we make our way towards that halfway point of 2014, and closer to the Annual BPW 2014 Awards, there are several companies looking to edge there way into the top 10! Our Official Best Pre Workout For Women rankings are released every June, and include results from extensive tests (meaning me and my friends tried them, and then chose our favorites :P) to determine which of the pre workout supplements is best for Women. 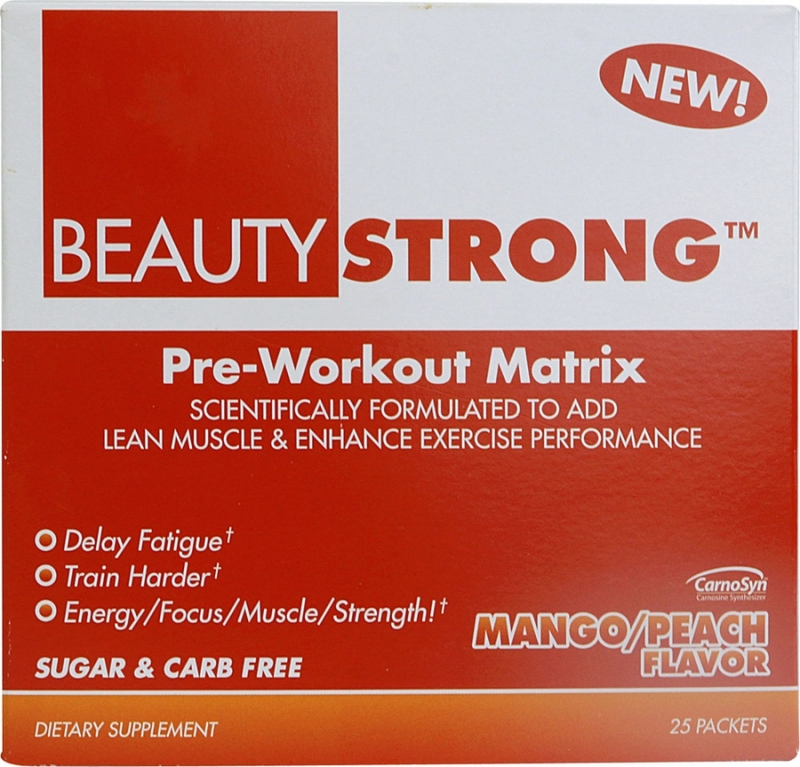 Beautyfit got the attention of me and my fitties from the outset because of it's distinct packaging and yummy-sounding flavors- but how did it hold up under the gun? Should you buy it? Keep reading because I'm going to break down Beautystrong in one of my most comprehensive reviews yet. I like to start every review with an overview of the flavor because, let's be honest, taste is everything. Yep even in a pre workout. I can't stand supplements that taste like crap- even if they do work! And you know what? I'm not the only one. Who consistently drinks something that tastes lousy? Nobody. Exactly. So Beautyfit is a women's pre workout that comes in 5 flavors. That's right- 5! That's a pretty extensive menu for a women's supplement-and any supplement in general actually. I think the longest menu'd (not a word) pre workout is Cellucor's C4- which is a solid product but honestly made my jacked. Not kidding. Anyways. Beautyfit comes in Green Apple, Mango Peach, Fruit Punch, Grape, and Pineapple. Now before you go thinking 'O I want the Pineapple one, that sounds amazing! '- you should know : it's sold out. So is the Fruit Punch (really? ), AND the Grape. So basically at this point you can get it in Green Apple or Mango Peach. Because I'm always looking for something new - I decided to go for the Green Apple. I knew that Greeen Apple supplements generally all taste exactly the same, and NOTHING like Green Apple, however, I'm sort of sick to death of the Peach Mango flavor. Everyone is pushing this flavor out there and in my opinion none of them taste very good. So I got the Green Apple, and it was ok. It wasn't absolutely amazing like some of the other better tasting supplements out there (see Ignite or Fem Fire or Toned), but at the same time it wasn't as bad as it should have been. Now that's sort of damning by faint praise- but if you tried it you would say the same thing. The sweetness was good in a weird way- it was almost none existent at the start and you could only taste the tartness of apple- but then as you swallowed it down you got a pretty nice little rush of sweetness that made the taste satisfying enough. The apple taste itself, as I anticipated, was very average. It had the standard 'green apple jolly rancher' effect that you get from literally anything flavored 'green apple'...other than green apples. So I had to give this flavor about an 8.5. Well actually it was an 8.5 but then my friend Liz had me change it to 8.3 because we're still mad at Beautyfit for being out of stock of the other flavors that we wanted to try. Ok so the taste was dece but how did this formula check out? As I leaked in the intro- I was TOTALLY underwhelmed by Beautyfit pre workouts supplement facts. First of all, the pouch is listed as weighing in at 8 grams. That's a pretty solid amount of powder. Because the serving size is so heavy, I expected to see a typical laundry list of ingredients in here, including at least the BCAA's in an adequate dosage. To my dismay, I found that not only were there no BCAA's in here- there's almost NOTHING in here! Look at the supplement facts panel- there's a trace amount of folic acid for some vitamin C, and then a bit of calcium which is a nice touch for a women's formula seeing as we're generally deficient in it (fear of dairy will do it). But after that, there's a 2.6 g blend, and the, nothing. So just so we're clear, there is well under 3 grams of active ingredient in this 8 gram serving. This is simply not acceptable and what I hate most about the supplement industry. The cost to manufacture this crap was next to nothing- yet they're selling it for $49.99. And that's for just 25 servings mind you! If you've read my reviews before- you know what's coming next. It's the question - so what is the rest of 8 grams? Well, the folks at Beautyfit were kind enough to let us know. The first listed of the 'other' ingredients is maltodextrin. A common favorite among supplement companies. Maltodextrin is filler. It's a flavorless polysaccharide that has no nutritional value and is dirt-cheap. Unfortunately, you'll find it in most dietary supplements as a way to cut costs or offset harsh-tasting active ingredients. Those are the negative sides of this ingredient profile- but is there any saving grace? Looking through the small number of functional ingredients that ARE included- you'll notice citrulline, beta-alanine, and caffeine as the top three ingredients. I'm not surprised at all. Beautyfit said, 'since we're not going to put much active product in here- what can we do to trick the customer into thinking that the product is 'working' ?' Well that's an easy one. Beta-alanine! This popular add-in is supplemented with for the purpose of improving endurance by increasing muscle carnosine levels, but the latest research shows that you would need an awful lot of it to actually do so. Getting back to the reason WHY this was included- it is because beta-alanine causes a slight itching or tingling sensation of the skin upon ingestion. Beautystrong uses it as it's way of telling us that it's working. Along with caffeine of course. Getting even deeper into the blend (and therefore into the ingredients that make up even LESS of the already small active ingredient blend) are rhodiola rosea, ginko biloba, and Alpha glycerylPhosphorylCholine. I don't have much to say about any of these- Alpha GPC has been used forever as a nootropic, and the same for the others. I went into the performance review expecting a superficial and short-lasting boost from the nootropics, followed by basically nothing. While some of my other reviews show a pretty significant variation between the ingredient review adn the perforamance review- Beautyfit Beautystrong might be the very first pre workout to score identical for both categories. The thing about Beautystrong is- it performed exactly how I thought it would. I took it 20 minutes before my workout, and felt the caffeine kick within minutes. To be honest I felt pretty good for the time leading up to my actual workout, and even into the warm-up and beginning of my run. I only had a 5 mile to do (training for the USM half-marathon! ), and this was a day where I was supposed to really be able to fly because I had the previous day off. As mentioned, I felt awesome for the first half as I benefitted from not only the initial effects of the pre workout drink, but also from the extended amount of rest I had just prior. Because of this, I really did fly for the first two miles- putting together back to back 6:30 minute times. But then, I swear I could feel the effects of Beautyfit start to let me down slow. Combined with the fact that I was all out cookin' for the first part of the run, and I started to struggle to keep my pace up. The third mile felt like it took a half-hour even though I was able to fight for a 7:00 pace. I'd rather not even talk about the last two, but I'm afraid we're going to. In addition to my ipod running out of battery, my pre workout was totally worn off by this point, and I was dragging you-know-what. I staggered off the treadmill with a pretty disappointing 42:32 total, and headed straight to Chipotle to eat my sorrows and write this review.